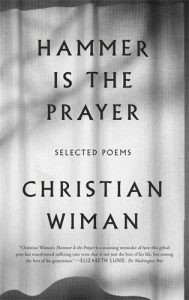 Christian Wiman holds one of a poet’s highest distinctions—that of writing the poems no one else could write before that poet came along. Like Hopkins, like Dickinson, like Rilke, Wiman is an originator of a mode. This doesn’t mean, of course, that he has no forbears or influences. Wiman’s thought—even his theology—seem aurally guided. This makes for a particularly visceral, incarnate theology in which his religious faith is concomitant with his faith in art, in the human creative capacity. Most notable in this poetic tradition are the Metaphysical poets and Gerard Manley Hopkins. Hammer Is the Prayer does—mostly—a good job showing Wiman’s development from a talented and careful young poet besieged by nostalgia, with a tendency toward portraiture, to the mature poet living literally at the brink of death due to a rare form of cancer, whose language and theology are wrenched tight to bursting. In this early work, we see how Wiman makes the ordinary—even the ugly—sing and come preternaturally alive. The young poet takes it upon himself to probe and elevate the real, and does an impressive job of it. There is a notable exception to the precision, skill, and metaphysical insight of Wiman’s early work, however. “Being Serious,” from his second book, Hard Night, is a very bad poem in a very fine book. It’s unfortunate that it’s so long (38 pages!). The protagonist of “Being Serious” is Serious—a satirical caricature, one senses, of the poète maudit. Serious is a misanthrope and a nihilist his whole life through. And then on his deathbed he is literally spoken to by God, who of course has never bothered speaking to Serious before, uttering the single word “Love.” And Serious dies with a smile that (somehow) becomes famous to the living who never knew or noticed him. It’s worse than a medieval morality play. Take the book off your shelf, cut those thirty-eight pages out, and put it back in a place of honor. Here we see instances of the powerful specificity and multivalence of Wiman’s verbs (“glaciers”—evoking slowness, immensity, and coldness at once), keen-eyed linebreaks (“so infinites-” highlighting the root infinite while simultaneously imitating the faceted glass and chrome by faceting the word itself; “up from God” breaking up the syntactic unit of an idiomatic phrase in order to sound multiple meanings), and his ability to make stock phrasing fresh by wringing it out for its most literal meaning (“gazing / dead into the sun”). Wiman does not depend on his trauma as a shortcut to poetic effect, but rather exerts pressure on language, compressing and chiseling it so that the end result is a striking, original, and memorable monument to his experience. withers in me like a salted slug. shatter me God into my thousand sounds. I don’t want to be alive enough to want that. Wiman is more invested in theological statements that sound right or ring true than in conforming to any orthodoxy or tradition. I don’t mean that he has no theological precedents, but that it seems his ear is the ultimate test of what he’s willing to say about God. Implicit in this approach is the idea that the use of language is a means of broaching on metaphysical truths, and it can be trusted to do so when used in service of art and based on felt experience. to a fear that I can bear. more than I can make. So, through language, Wiman believes that he can indeed make something, say something that contains at least a measure of truth—although it will always be incommensurate and imperfect. Anything more is beyond the purview of the poet and will have to be undertaken by God. two score and ten gently bewildered men lip-synching along. You’re up, Pastor. Bring on the unthunder. Religion full of platitudes and unalloyed with the pain and difficulty of actual life is abhorrent to Wiman.